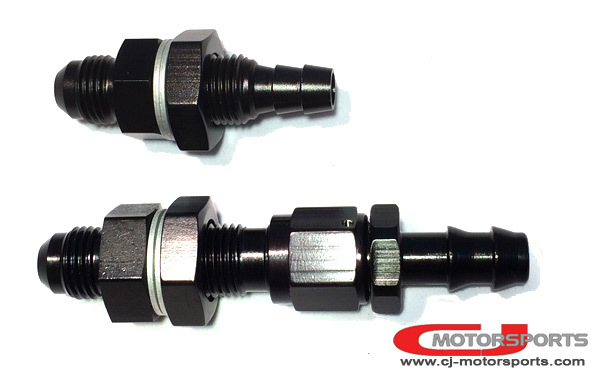 The CJ Motorsports barbed bulkhead fitting is a solution we have exclusively designed and manufactured for customizing fuel sending units and surge tanks. This low-profile solution conveniently adapts your external -6 AN plumbing to your internal 5/16" or 3/8" hose barb connections. With limited depth available in fuel tanks and surge tanks, the CJM barbed bulkhead fitting saves about 1.20" length over a typical hose barb adapter combination. The hose barb specifications of our fitting were specifically designed to be used with both 3/8" and 5/16" Gates submersible in-tank hose. The 5/16" hose will stretch over the barbs with ease, and the sharp barbs are large enough to bite into 3/8" hose. Due to the broader size compatibility, these are not push-fit style barbs. A hose clamp is required. The hex size is 13/16". The barbed area will insert 0.600" deep into the hose. Typical -6 washers and nuts are compatible. Maximum bulkhead panel thickness is 1/4" when installed with 2 aluminum washers.